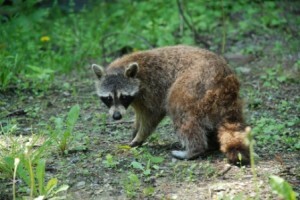 This spring, sick raccoons have been observed over a broad geographic range in southern Ontario. Affected animals have been observed out during daylight hours, showing no fear of humans, and exhibiting a variety of neurological signs. As well, many have been observed with discharges from the nose and eyes. It is highly likely that these animals are infected with Canine Distemper Virus (CDV). This is by far the most common infectious disease in raccoons in southern Ontario, and large numbers of cases of it are diagnosed each year. The virus of CDV is shed by affected animals through several routes – nasal and ocular discharges, urine, and feces. Generally speaking, the virus is fragile in the environment and requires close contact in order to spread from an affected to a susceptible animal. Peak times of year for the disease appear to be both spring and fall. These are times of year when there is likely to be the most contact between animals. Also, there are likely to be large numbers of naïve animals present, as the previous summer’s young are on the move and attempting to establish themselves in new areas. This year, there have been reports of observations of sick raccoons all the way from Windsor to the Niagara Peninsula and north to Grey and Bruce counties. Not all of these geographic foci of disease have yet been confirmed by post-mortem examination of affected animals from each area. Nonetheless, given the pattern of disease and the clinical signs reported, CDV is the most likely diagnosis. The possibility that rabies may be present in these areas should not be completely dismissed. There are cases of raccoon rabies occurring on the American side of the Niagara River and raccoons do cross back and forth. It is important that the possibility of rabies be considered in the examination of raccoons from this area. Also, there is still a small amount of rabies activity in southwestern Ontario, north of Guelph and Kitchener-Waterloo, primarily in skunks. Although the disease has almost been eradicated in this area, it is necessary to rule it out in cases of neurological disease, particularly in skunks, from this area.